Lately, I've felt a lot like Heather - absolutely uninspired and in need of some inspiration. I attribute it partially to the change in seasons - this time of year is always hectic with the beginning of nice weather activities, invitations to outdoor parties and the like. On top of that, there are big time requirements of me at work, my husband and I are working to sell a home and things just add up to a feeling that is less pretty-rainbows-inspiration and more grey-just-get-through-the-day-alive. ...and I have it easy! How do you guys with children to care for or parents to care for do it? It makes me tired just thinking about it. When I'm feeling stressed or rushed, I head to an unlikely place - Pinterest. Of course, the whole aura around the online pinboard is supposed to be one of inspiration, but I hear a lot of people talk about how Pinterest brings with it a lot of pressure to make every project pinnable. I must not take on that stress easily, though. I can pin it and forget it. That's the beauty of taking a few minutes to go back through some of my pinboards. It's like it's brand new again! What are some of your favorites? Have you checked out the HerKentucky Pinterest boards? There's always something inspiring there! A friend's dad always said, "Don't ever let schoolin' get in the way of your education." I'm glad I never did. At age 10, I embarked on my first trip abroad to Austria for a family ski trip. Foreign travel opened my eyes to a larger world of new sights, sounds, smells, and tastes - experiences that cannot be taught in a classroom. The trip to Austria would be the first of many. At fourteen, I spent the summer abroad in Germany, and have since traveled to 27 other countries, including a few island countries, and summers in France and Mexico. My love for travel and other cultures even led me to a Master's degree in International Relations. I am inspired most by foreign travel. When I need to recharge, I love to hop on a plane and get lost in a sea of new faces, places, and stimuli. I find that I appreciate my life and surroundings even more when I come back home to Kentucky. Ansel Adams said, “You don't make a photograph just with a camera. You bring to the act of photography all the pictures you have seen, the books you have read, the music you have heard, the people you have loved.” I would add, "the places you have traveled." ﻿and my heart in Kentucky. Follow us on Instagram to see more of our inspired Kentucky photography: http://instagram.com/herkentucky. In "foreign travel", "glenda", "inspiration", "kentucky", "quotes", "travel"
A few weeks ago, I was reading a fun fashion blog -- Glitter and Gingham -- that's run by a Lexington expat. She'd built an outfit around a fun Kentucky t-shirt, and she started the post out by saying "I have a theory that every Kentuckian is obsessed with Kentucky." Now, Shelby's outfit was adorable, but her idea is what really stuck with me. Most Kentuckians I know are really into being from Kentucky. We spend a lot of time quoting little factoids about the Commonwealth. And why shouldn't we? We're only home to the prettiest land, the best college basketball teams, the greatest horse race, and bourbon. Any one of these are enough to make us cocky. No wonder most of us are, to borrow the phrase, obsessed. Here at HerKentucky, we've been focusing on inspiration lately. The people and places and sights and sounds that inspire us. As we each have posted essays and photos about our sources of inspiration, I've realized how much Kentucky inspires me every day -- from its rich traditions and history to its unique and beautiful scenery. Whether my love for The Bluegrass State stems from obsession or inspiration, I find that my Kentucky experience colors my writing, my political viewpoint, my approach to cooking and hospitality, and so many other aspects of my daily life. In so many ways, Kentucky inspires me every day. How does Kentucky inspire you? In "HerKentucky", "belle of louisville", "gratz park", "inspiration", "kentucky", "lexington", "rupp arena", "transylvania"
The past few months have really kind of sucked. I've been hit with a lot of things that seem banal when they happen to other people, but when they happen to you they're epic. There have been days when it all seemed insurmountable. Days when I didn't know where or how to start fixing it all. Days when simply composing the to-do list took an hour, and I can't even talk about how long it would take to complete. I've desperately needed to get over it, tackle the things I can fix, and deal with the things I can't. These days, I realize, are when my girlfriends have kept me afloat. I've found my inspiration in my friends. Sometimes, a short, pithy, emoji-filled text message is all it takes. Sometimes, it's an email that answers my questions, or an in-joke Facebook post. Suddenly, I'm ready to do a round of sun salutations and tackle the day. I find my inspiration in my cousin, who's quite literally been my BFF since we were born, and in my college girlfriends, whose hilarious and heartwarming and always-entertaining group texts would make Regina George blush. I find inspiration in the friends I've made through my sorority, the Junior League, and the crazy world of blogging. And, I'm astonished every day at the inspiration I've found through the women who contribute to this blog - smart professional women who lend their time and talents to create a site we love. I love that I don't always have to thank these women for their friendship; I just know that they're there. I love that I don't always have to tell them the details of my problems; I can just say that things aren't going well. I love that I sometimes awake to 30 new text messages written in LOLCAT or peppered with a few wine-related typos. I love that I have an amazing network of female friends who inspire me every day. How do your friends inspire you? In "HerKentucky", "friendship", "inspiration", "women"
Sometimes, when I'm feeling completely drained and uninspired, I have to get away from everything. When I moved to Lexington (pop: over 300,000) from Lancaster (pop: under 4,000), I was enamored with Lexington's abundance. Whatever Lancaster had, Lexington had more. People. Cars. Buildings. Schools. Libraries. Stores. Cars. Farms. Parks. Gyms. Restaurants. Cars. It took about two years for that to get really, really old. I still enjoy the things Lexington has to offer, but every now and then, I need to escape it. I have to find a way to get out, even if it's just for a day. I crave silence and space, and a reminder that life really is fairly simple. I love road trips for this very reason. I get to be alone in my car with my thoughts and my music, and it gives me time to recharge. I found a song several years ago that so perfectly describes the feeling I get when I finally have some alone time, and I'm sharing it with you here now. I'm all at sea where no one can bother me. I sleep by myself. I drink on my own. Please just leave me right here on my own. You guys. Giving away my phone and going back to a time when I could actually disappear from everything for a while is kind of my dream. Sometimes I get so caught up in life--the day-to-day routine of things where I go to bed at night and can't remember a single thing I did that day--that I sort of lose myself. Writing is one way I keep in touch with who I am, but sometimes I'm so lost I can't even put words together. One of my favorite road trips is the short one to my childhood home. The hundred-year-old farmhouse and five acres of land I grew up on is only about forty miles from where I live now. Everyone who knows me is well aware of my love affair with my parents' home. It's the most beautiful, peaceful place I've ever known. The constant activity of my days can make time pass entirely too quickly. As I get closer and closer to home, everything slows down--the minutes stretch on forever and the houses move farther and farther apart. That front porch is the only place I can be completely alone without shutting any doors. I do my best thinking there. The solitude gives me a chance to remember who I am and what's important to me. I can't sit on that porch with that view and not take a moment to appreciate everything I have. It's so easy to get lost in the minute details of life, the things that won't make a difference a month or year from now, and I find myself just trying to make it from one day to the next. The peace and quiet found on my parents' porch inspires me to be the kind of person who doesn't get so caught up in looking forward that I forget to stop and truly enjoy the present. In "central kentucky", "inspiration", "lancaster", "lexington", "megan whitmer", "music", "photos"
As the weather heats up and the colors get brighter, I'm feeling inspired by all thing summer, particularly those little pieces of the season that are distinctively Southern or distinctively Kentucky. 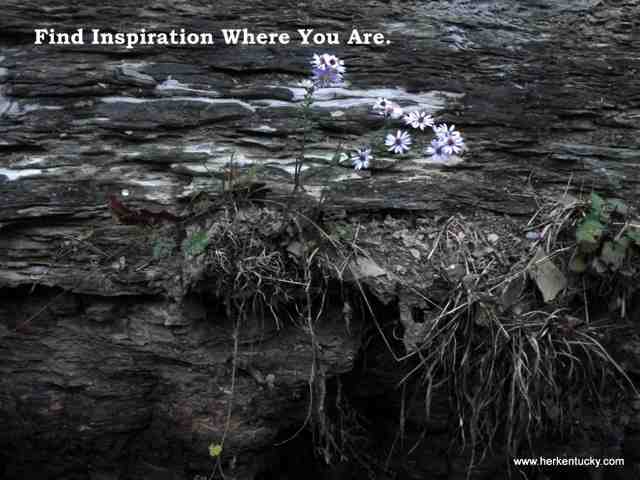 May is all about Inspiration here on HerKentucky. Last week, our writers posted about the mothers who'd inspired them and the many ways that Kentucky has inspired their own parenting decisions. As we planned the editorial calendar for the rest of the month, we talked about additional ways to spotlight the Kentucky women who've inspired us -- mothers and daughters, graduates and brides. It's a really well put-together plan; I'm quite proud of it. Speaking of which, did you see the awesome blog entry I wrote yesterday? No, you sure didn't. Because I've, as my grandmother would say, run plum out of inspiration. I just have nothing to say. For a "word girl", as my editrix at Ace calls me, that's a bad situation indeed. Recently, I've been working on a novel, a couple of freelance projects, and some essays. And, for the past few days, they've all been on hold. I just have nothing to say. I'm in serious need of inspiration. I take so much inspiration from the accents and customs around me and the landscape that frames them. Maybe I shouldn't try so hard to force inspiration; maybe it's just there. Maybe it's all around me if I just sit back and observe. Makes sense, right? 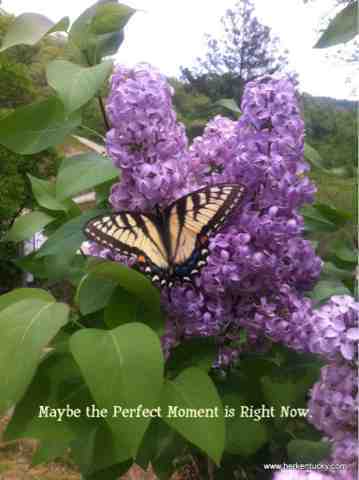 The other day, I stood in my mother's yard with my iPhone for several minutes, trying to capture the perfect photo of a butterfly in the lilac bush. It was patient, and so was I, and eventually the whole thing came together in a stunning fashion. But, you know, the other handful of pictures were pretty damned good as well. And, if the butterfly hadn't fully opened its wings, or if it had never turned to just the right angle, it still would have been a beautiful and perfect moment. I suppose I should look at inspiration the same way -- the perfect circumstances may never arise. The perfect inspiration likely isn't out there; maybe there are plenty "perfectly good enough" moments to kick me into gear. What about y'all? 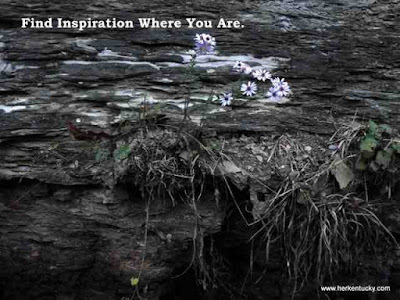 Where do you find your inspiration?